Located in a mountainous border region, Cao Bang province is home to the diverse culture of local ethic minority groups, as well as historical sites and stunning tourist attractions. The local authorities have rolled out every effort to utilise these advantages in the building of signature tourist products in a bid to foster the local hospitality sector. Cao Bang province is the cradle of Tay, Nung, H’Mong, Dao, San Chi, Lo Lo and other tribes, each possessing a unique colour of its own indigenous culture. The province is the homeland of many popular festivals and rituals, including the Long Tong festival (Going to the Field), and the cap sac ritual (a rite of passage declaring the coming-of-age of Dao men within the community) as well as the charming melodies of folk singing, such as then, sli and luon singing. Cao Bang has also been bestowed many fantastic tourist attractions by Mother Nature, including Ban Gioc waterfall, Phia Oac – Phia Den National Park, and Non Nuoc Cao Bang Geopark. Aside from its natural values, the land of Cao Bang also attracts visitors to explore its tangible and intangible cultural heritages and historical revolutionary sites. Prominent among them include the special national relic site of Pac Bo, where President Ho Chi Minh returned in 1941 to lead the revolutionary movement after spending over 30 years in other countries to seek ways for national salvation; and the special national relic site of Tran Hung Dao Forest, where then General Vo Nguyen Giap established the Vietnam Propaganda and Liberation Army in 1944, the predecessor of the Vietnam People’s Army today. Thanks to the vast advantages, Cao Bang has become an unmissable place for visitors that are interested in experiencing local culture and exploring natural and wild scenery. At the end of 2015, the Cao Bang provincial authorities established the Non Nuoc Cao Bang Geopark, designing it as a model for sustainable socio-economic development, environmental protection, and traditional cultural preservation. The move also aimed to effectively bring into full play the available advantages of culture, eco-tourism and community-based tourism of the site. Two years after the establishment of the geopark, which covers more than 3,000km² in nine districts and hosts over 130 geological, cultural, historical and natural sites, three tours were set up within the territory of the park. The first tour explores the Phia Oac mountain peak, the second one introduces visitors to the historical sites of Cao Bang, and the third one invites tourists to experience the indigenous culture of the locals. In April 2018, Non Nuoc Cao Bang Geopark was recognised as a global geopark by UNESCO, creating considerable momentum for the locality’s tourism development. According to Truong The Vinh, Deputy Director of the provincial Department of Culture, Sports and Tourism, UNESCO’s title has affirmed that the cultural identity, the land and people of Cao Bang have attracted great interest from both domestic and foreign visitors. Cao Bang welcomed around 952,000 tourists and earned approximately VND189 billion in the tourism sector in 2018. The locality was visited by more than 8336,000 tourists in the first eight months of this year, including nearly 71,000 international arrivals, up 98.6% against the same period last year. Meanwhile, revenue from tourism reached VND219 billion, up 65.65 year on year. The provincial hospitality sector has set a target of receiving more than 1 million holiday makers in 2018. 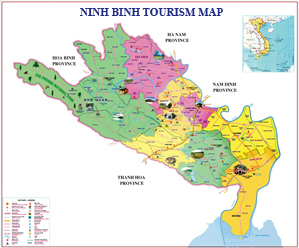 According to Trinh Huu Khanh, Vice Chairman of provincial People’s Committee, a number of solutions have been taken to realise the task, while developing tourism in a sustainable way, including developing a signature tourism brand, enhancing human resources, improving the infrastructure system, and diversify tourist products to meet the increasing demand of visitors. The provincial authorities have implemented favourable policies in support of businesses operating in hotel and restaurant units, while stepping up tourism promotion programmes outside the province, mobilising investment in tourist activities, encouraging local people’s participation in boosting tourism, and raising public awareness of heritage conservation. Priorities have also given to safeguarding and upholding the value of the UNESCO-recognised Non Nuoc Cao Bang geopark, and introducing the three tours to introduce the park to more visitors.